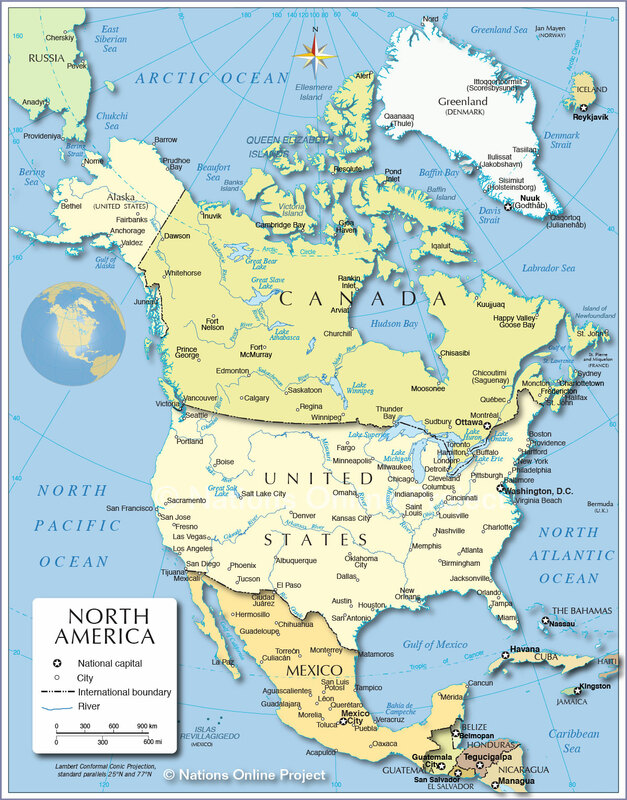 North America is a continent which comprises the northern half of the American landmass, it is connected to the South American landmass by the Isthmus of Panama and is separated from Asia by the Bering Strait. North America contains Canada, the United States, the Bermuda Islands, Mexico, the countries of Central America, the Caribbean islands, and Greenland, the world's largest island is located mostly within the Arctic Circle and belongs geographically to North America, politically it belongs to Europe it is part of the Kingdom of Denmark as a self-governing overseas administrative division of Denmark. Technically half of Iceland belongs to North America because half of the island is part of the North American tectonic plate, the other half is on the Eurasian plate. The Isthmus of Panama is regarded as the southernmost part of North America. This narrow strip of land which lies between the Caribbean Sea and the Pacific Ocean connects North and South America. On the Isthmus there are the countries of Central America, namely Guatemala, Belize, Honduras, El Salvador, Nicaragua, Costa Rica, and Panama. North America includes also most of the Caribbean islands even though all islands south of Cuba belong, strictly speaking, to another "continent", they are part of the Caribbean tectonic plate which is wedged between the North American plate and the South American plate. There are the sovereign states of Antigua and Barbuda, the Bahamas, Barbados, Cuba, Dominica, the Dominican Republic, Grenada, Haiti, Jamaica, Saint Kitts and Nevis, Saint Lucia, Saint Vincent and the Grenadines, and Trinidad and Tobago. And there are the dependent territories of Anguilla, Aruba, British Virgin Islands, the Cayman Islands, Guadeloupe, Martinique, Montserrat, Puerto Rico, Turks and Caicos Islands, and United States Virgin Islands. The continent is bordered in north by the Arctic Sea, in west by the North Pacific Ocean in east by the North Atlantic Ocean. The map of North America shows the states of North America with their national borders, the national capitals, as well as major cities, rivers, and lakes. Interactive map of North America. Click on the map's country names to get to the respective country profile, or use the links below. Get more information about the large cities in North America by clicking on a city name. Country maps will be found on the respective country page. back to small map of North America.